Hey there fish fans! Hope you had a great fourth of July holiday. The Marlins sure did. The latest set of games were both exciting and cringe-worthy. Great, but also incredibly infuriating. Let’s get to it. The Marlins hosted the Tampa Bay Rays, going right into extras to start the series after Kyle Barraclough blew the save by giving up the RBI-double to C.J. Cron. Tie game? No sweat. Yadiel Rivera saved the day with a walk-off single towards third, scoring Brian Anderson as the throw was both not on time and wide right of Wilson Ramos. 3-2, Marlins. Starlin Castro had a terrific evening (4-for-4) while his teammate, Miguel Rojas, went 3-for-4 with an RBI. The ever dependable J.T. Realmuto padded his All-Star resume, going 2-for-5 with his own RBI. Tampa Bay struck back in the second game, this one also going to extras. And by extras, I mean nearly playing two games worth of innings. After falling behind early, the Marlins rallied, tying it 4-4 in the fifth courtesy of Anderson (RBI- single) and Realmuto (Sac fly). For the next 10 innings, not a single runner from either team made it home. Miami sure had their chances, particularly in the fifteenth frame with Realmuto hitting an excellent double, but the Fish just couldn’t get anything going before the Rays exploded for five runs in the 16th. Brett Graves was just unable to keep them off the board despite an awesome heads-up double play by Castro. Miami tried to make up some ground but it was too little too late, the in-state rivals emerged victorious 9-6. The Marlins closed out the Rays in the rubber match with a 3-0 shutout. Jose Ureña (Fresh from the DL) bullied the Rays for five innings, holding them to just three hits as JT Riddle came a double short of hitting for the cycle, going 3-for-4 with 2 RBIs. Next up, our division rivals. Unfortunately, as Miami traveled to our nation’s capital, little did they know what was in store. The Nationals ended up taking three out of four, throwing some ice cold water on the Marlins’ momentum. And that’s not the worst of it. It all started with the opening game MELTDOWN. Miami blew a 9-0 lead as Trea Turner went absolutely H.A.M. on the pitching staff. The leadoff man manufactured 8 RBIs, including a grand slam, his second homer of the night by the way, in the sixth. Marlins rookie Pablo Lopez ran out of steam (5 IP, 5 Hits allowed, 5 Earned Runs, 3 K’s) and Adam Conley only made things worse, coughing up five runs of his own. The Nats won in the ensuing shootout 14-12. AI YAI YAI! The Fighting Fish were in for even more frustration as Washington won the second game with a pinch-hit walk-off dong from Mark Reynolds against the closer Kyle Barraclough. Dan Straily’s good outing (6 IP, 5 hits allowed, 2 Earned Runs) went to waste with the team stranding 8 runners despite their 9 hits. Reynolds wasn’t finished with us. The following game he went 5-for-5 tallying 10 RBIs, you read that correctly, 10 including going yard twice en route to a 18-4 demolition, effectively winning the latest series for the Nationals. Wei-Yin Chen and Elieser Hernandez were lit up, giving up seven and 10 runs respectively. You want it original recipe or extra crispy? The club finally got its act together in the finale, vengefully unleashing 22 hits in the 10-2 rout. Realmuto led the way going 5-for-6 with 3 RBIs in a statement towards the baseball gods for All-Star consideration. Justin Bour (2-for-5 2 RBIs), Riddle (3-for-6 2 RBIs) and Martin Prado ( 4-for-6 1 RBI) also had great outings. This was certainly a rollercoaster. We went from a high of defeating our in-state rivals to a frustrating series at our nation’s capital, letting the Nationals slip away time and again. With the exception of the third game, the first two were very winnable. Miami could’ve come away with a split, or even better taking three out of four. Wouldn’t that be something. That’s baseball for you. This serves as a sharp reminder of our current situation. This is why it’s a season dedicated to the growth of the rookies and nothing more. We’ll have our little streaks here and there, and by all means enjoy them, but no one is delusional enough to think the ball club as is, is even close enough to compete, either this season or next. The way we blew that first game is still outrageous. After such a performance at the very least, Conley should get sent back down, again. Prior to the meltdown, he was doing fine for a while actually, but it’s still Conley and we know what we’re going to get. It’s never a good feeling when the team is on the wrong end of epic comebacks and historic individual performances. Add in the notion your better than what the record suggests and in the end, the series is one of those contests you’d like to have back. The Marlins probably do. Or maybe not. Given the long season, it happens. Worse, Miami is not able to consistently roll with better teams. Not yet. Which brings us to the next subject. As we near the All-Star Break and the inevitable trade deadline, does the club buy, sell or hold? 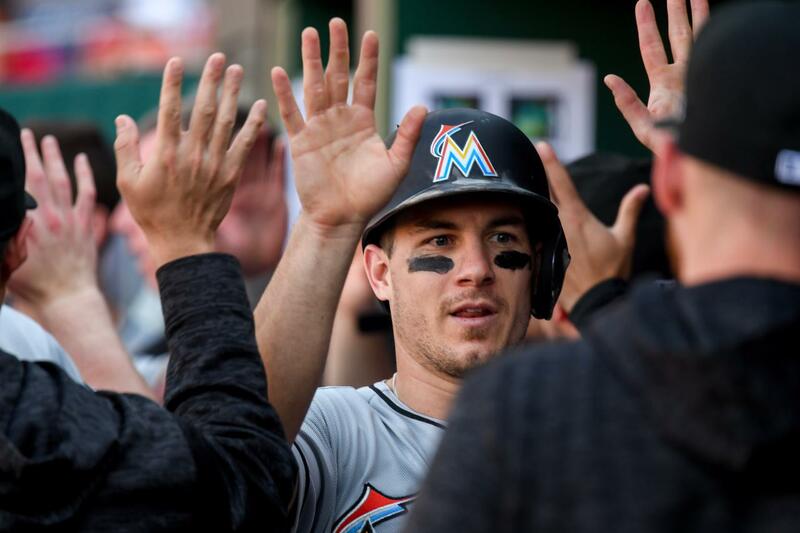 As of Monday afternoon, the Marlins remain in the cellar of the NL East, 14 ½ games behind the division-leading (Barely) Atlanta Braves and around the same amount in the Wild Card race. While not the worst in the Majors, the team is last in the National League. Buying is out of the question, there’s too much ground to cover and it runs counter to the organization’s long-term strategy. Is a mid-season blow up in the cards then? Not necessarily. The salary dump already happened and it’s already been alluded that unless they get paid a handsome ransom, Realmuto is staying put. The club could shop around Kyle Barraclough, Justin Bour, Brad Ziegler or even Adam Conley, considering they’re smaller pieces, to continue building up the farm system. In Barraclough’s case, his value has not hit the ceiling, something to consider if you want to flip him in the future for prospects. There is of course the last option. Your NL Reliever of the Month, @kbclaw34 joins @AlexaDatt and @StephenNelson on @MLBNetwork‘s The Rundown at 3PM. Miami could just have a (very) quiet July and wait until the winter meetings and beyond to make waves. I don’t think this is the ownership’s style, certainly not DJs, especially in their first season. The team should definitely be sellers, but at the right price. It’s high time the organization played a lot smarter when it comes to trades, especially with prospects involved. It’s important to play for the future, succeeding today to own tomorrow. The team should deal Barraclough and Bour for a nice batch of prospects. In the event of the former, the closer role will probably go committee with Drew Steckenrider getting the first lick. Forget Ziegler. The next installment will carry the grades of the team overall and several individual players, making for an interesting glance at Miami’s first half of the season with some thoughts on what’s ahead. Until then Marlins faithful, stay safe and stay frosty. With that win, Miami snapped an insane 14-game losing streak against their division rivals. Also, Brian Anderson got his 99th hit of the season, tying Alex Gonzalez for the most by a Marlins rookie before the All-Star break. The record dates back to 1999 and boy, consider it shattered with number 100 and beyond! Miami’s No. 2 prospect Sandy Alcantara will begin throwing on Tuesday, the first time since he was placed on 10-day DL with a right axillary (armpit) infection. Given the good health of the starting rotation and his value as a ballplayer, the organization is in no hurry to bring him back. Lewis Brinson is still days away from his own baseball activities, continuing with his rehab. He’s been on the 10-day DL since the marathon with the Rays on July 3rd with right hip inflammation. No. 14 prospect Braxton Lee continues to struggle at the plate, hitting .205 in his last 10 games just before the break. The 24-year-old is batting .202 for the year in 94 At-Bats including 6 RBIs and 23 whiffs at the plate with the New Orleans Baby Cakes. He briefly played for both the Jupiter Hammerheads (Advanced-A) and the Jacksonville Jumbo Shrimp (AA) back in June.